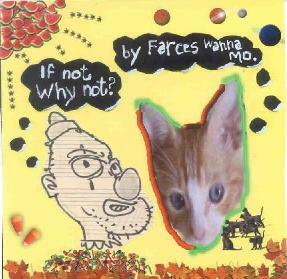 Farces Wanna Mo - "If Not Why Not?" This is a California band that has created 13 records in the past 15 years or so. I gather it is a loose collection of folks with a few main members. It is pretty low fi at times and very strange stuff. I really love the titles of their compositions (hard to call some of them songs). Here are a few for you: "I Remember Jimmy Carter", "Here Is A Cake", "Who's Got Time To Build Infrastructure? ", "Bela Lugoise Loves Hinky-Tonkin'", "3 Months Of Compulsive Sobbing" and "A Jarring Sense Of Calm". This is a pretty far out mixture of sampling with wild abandon and strange music composition. Get stoned and have a real trip. For more information you can visit the Farces Wanna Mo web site at: http://www.farceswannamo.com. Hear sound files at the Farces Wanna Mo Mp3.com web site at: http://www.mp3.com/artists/494/farces_wanna_mo.html. Contact via snail mail c/o Dave W.; PO Box 1837; Twentynine Palms, CA 92277-1250.